Seablite (also called Southern Seablite) is a type of Amaranth, native to all states of Australia except the Northern Territory. Early settlers used the leaves as a vegetable and pickle. It thrives in saltmarshes and other saline conditions around the country. Eaten fresh, the edible leaves are pleasantly salty with a light, crunchy texture. They go well in salads or as garnishes for other savoury meals. As a cooked vegetable, they bear resemblance to young bean shoots in texture. 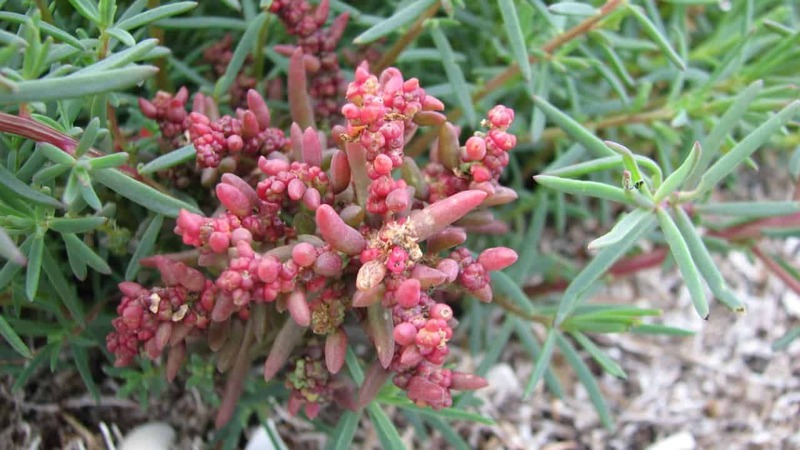 Seablite is also a delightful bush food for pickling. Harvest Seablite by plucking fresh stems often from the main plant as it grows, or pull it out entirely by the root. Choose a full-sun or part-shade spot in the garden and water well throughout summer. Seablite is a fast grower that prefers moist soil, regardless of whether it’s sandy, loamy or heavy clay. This species tolerates a wide range of pH and thrives in saline conditions. It bears pale green leaves, with pops of pink clustered flowers that bloom from Summer to early Winter. Seablite grows to 20-50cm in height, reaching out to 2m in diameter as an upright or spreading shrub. It makes an attractive edible feature bush in a succulent garden, rockery or side garden bed. How often should I water my Seablite? As a salt marsh native, Seablite prefers moist conditions and will tolerate some waterlogging. Water it well and often throughout the hot Summer months, paring back during the cooler season just to ensure the soil stays moist. Can I grow Seablite in soil that’s not saline? Seablite can still grow happily in suburban gardens away from the coast, free from highly saline soil. If growing in a pot, once in awhile, just give your plant a little drink of seawater — it easy enough to wring out your hand-washed bathers after a day at the beach. Probably your neighbour! Seablite doesn’t suffer from many pests and diseases. Your main competition is other hungry foragers.